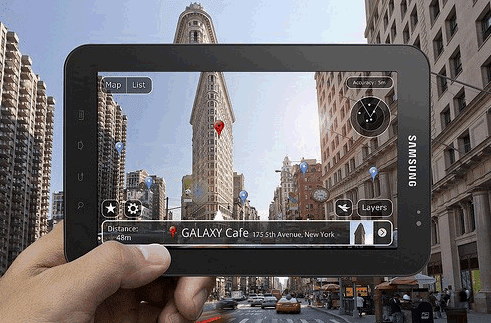 This post collates all relevant information about Samsung Galaxy Tab in the Philippines. As of today -- we're still awaiting word from Samsung PR Philippines regarding Samsung Galaxy Tab's availability and pricing details in the country. We promise to regularly update this post as more information about the slate in Pinas surface. In the meantime, if you will, watch the official promotional video of Samsung Galaxy Tab and read TP's comprehensive specifications check. 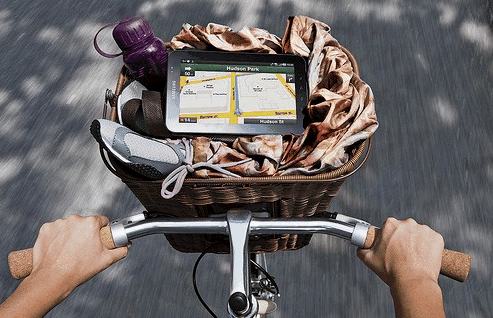 Samsung Galaxy Tab brings together all of Samsung's innovations to provide users with more capabilities and greater connectivity while on the move. Finally, consumers are able to experience full web-browsing experience and enjoy top-notch multimedia content on the perfectly sized and highly portable 7-inch display wherever they choose to go. Likewise, users can continuously communicate via voice and video call, e-mail, SMS/MMS or social network with Tab's optimized TouchWiz 3.0 user interface. 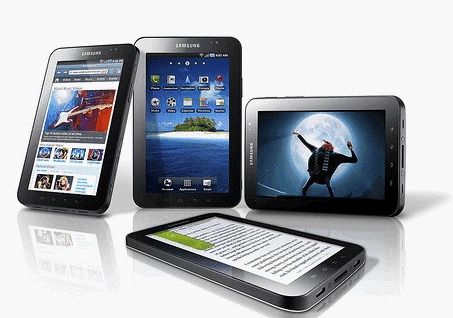 As an integral part of a new device category, Samsung Galaxy Tab offers a wealth of mobile experiences. The slate's striking 7" TFT-LCD display is great for watching films, e-reading, viewing pictures or e-reading. As for design identity, its light build (weighing in at only 380 grams) provides perfect portability, while its svelte dimensions makes it easy to grip and use. Supporting Adobe Flash Player 10.1, Samsung Galaxy Tab offers swift, seamless viewing of every single webpage you may land on. Readers Hub, Samsung's very own e-reading application, provides access to a vast digital library – from reference materials to classical literature to latest bestsellers. At the same time, users also get Media Hub, a gateway to a world of videos and files, and Music Hub, an app that offers access to a wide range of music tracks. 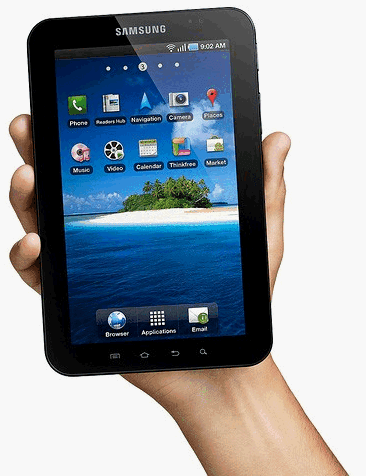 With 802.11n WiFi, Bluetooth 3.0 and 3G HSUPA connectivity, Samsung Galaxy Tab brings mobile communication to a new level. Also, push email and video conferencing on the large 7-inch display make getting in touch with business partners, friends and loved ones more efficient and smooth. As for voice calls, Tab could be a perfect speakerphone on desk or a cellphone on the move via wireless Bluetooth headset. Powered by Cortex A8 1.0GHz chip, Samsung Galaxy Tab is designed to deliver high multimedia features and performance wherever you are and whenever you want. HD video content is supported in a variety of formats (including H.263, DivX, MPEG4, XviD, MPEG4, H.264 and more) which contributes greatly to the overall viewing experience. The device's front-facing camera, on the other hand, lets users make face-to-face video calls over 3G; while the rear-facing camera captures videos and images that you can edit, upload and share instantly on the web and your social networking accounts. As yet, we don't have word from Samsung on pricing details of Samsung Galaxy Tab. Projected release date, on the other hand, is sometime in Q4 this year. We hope to get hold of a Samsung Galaxy Tab unit soon so we can give our full review.